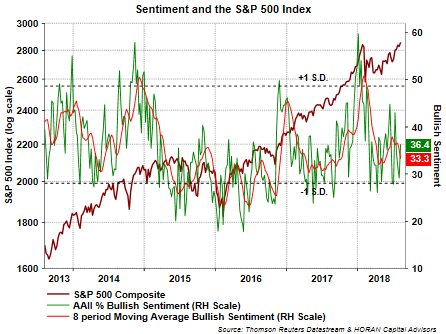 Keeping in mind sentiment data is contrarian in nature and most predictive at its extremes, today's American Association of Individual Investors Sentiment Survey report shows bullish sentiment increased over seven percentage points to 36.36%. The plus and minus one standard deviation levels for the bullishness reading are 48% and 28%, respectively. Although the bullishness reading jumped higher in this week's report, the reading remains below the average reading of 38%. In order to minimize the weekly volatility often the 8-period moving average is evaluated as well. This week the 8-period moving average continued moving lower to 33.3% and is represented by the red line on the below chart. Compared to the beginning of the year, newsletter writers' bullishness has trended lower too. 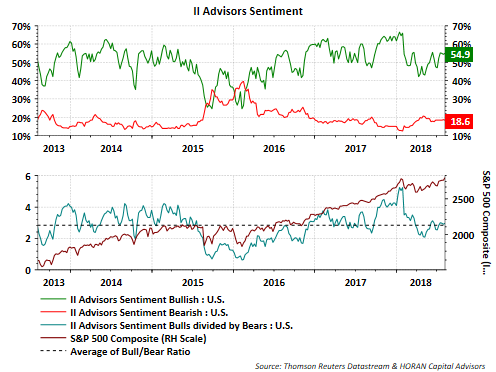 The Investor Intelligence Advisors' Sentiment bull/bear ratio has fallen to 3:1 versus over 5:1 at the beginning of the year. The II Advisors' Sentiment Survey studies in excess of one hundred independent market newsletters and assesses each author’s current stance on the market: bullish, bearish or correction. As extreme bullishness would be one indication of a potential market top, the above noted sentiment reports are not at extreme levels of either bullishness or bearishness.